A wide variety of custom packaging is available. We offer custom-printed tuck boxes (available with card orders only), which require a minimum order of 400 decks. 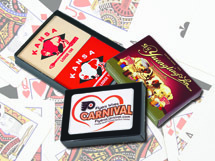 Both single- and double-deck plastic boxes are available for bridge-sized cards, and single plastic boxes are available for poker-sized cards. Bridge-sized velour boxes, both single and double, and single velour pouches, are available and may be hotstamp imprinted. For a quote on velour hotstamping, please contact us. Beautiful rosewood boxes are available for poker-sized cards.